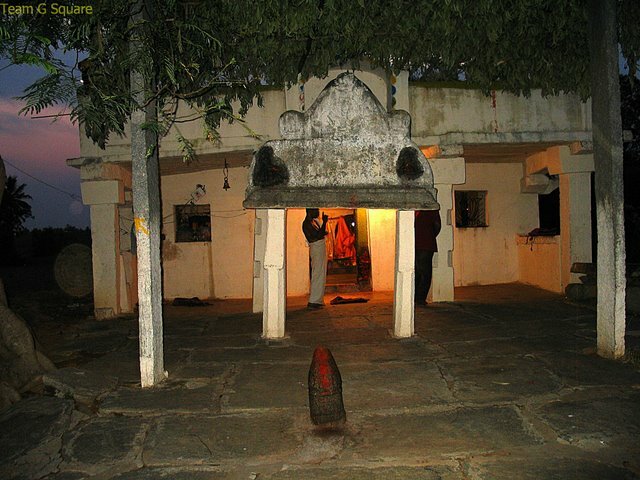 "Vagata", a village located about 6 km from Hoskote was a very prosperous town under the Cholas. Ever since we read about the historical significance of this place, we were curious to explore but lack of information and details of its location, kept us away. 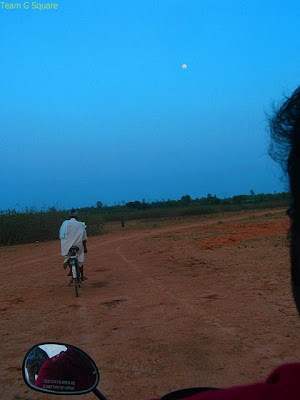 We tried to track the location by inquiring a few friends of ours who hailed from Hoskote, but to no avail. Finally, a friend returned our call for giving us the exact location of this place. Vouching on his information, one Saturday evening, we headed towards exploring this place.We had no trouble in reaching this place, thanks to the detailed information given by our friend. 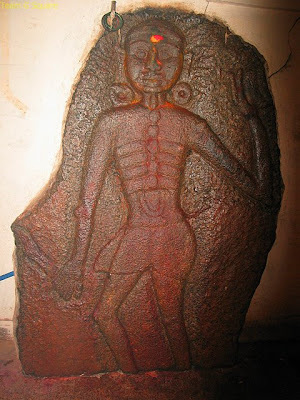 Vagata was known by several names such as Ovattam, Varadaraja-Chaturvedi-Mangalam, Ogata, Bhagirathipura, Yogapuri and so on, under the reign of various kings. The earliest inscription found here has a mention of Raja Rajendra Chola who ruled during the 10th Century. 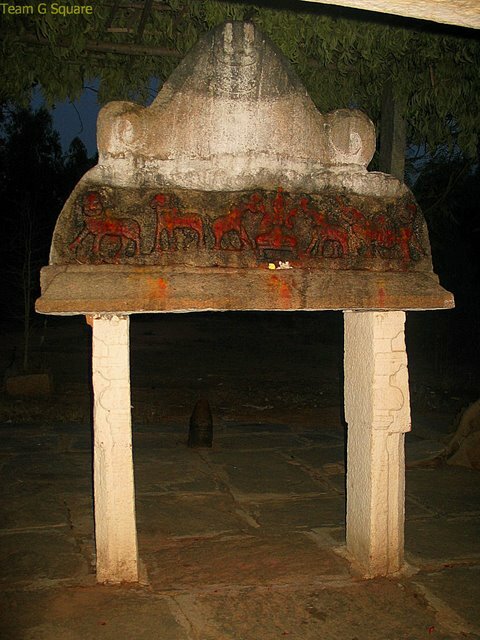 There are many old temples in this village, courtesy the Cholas and Vijayanagar kings. 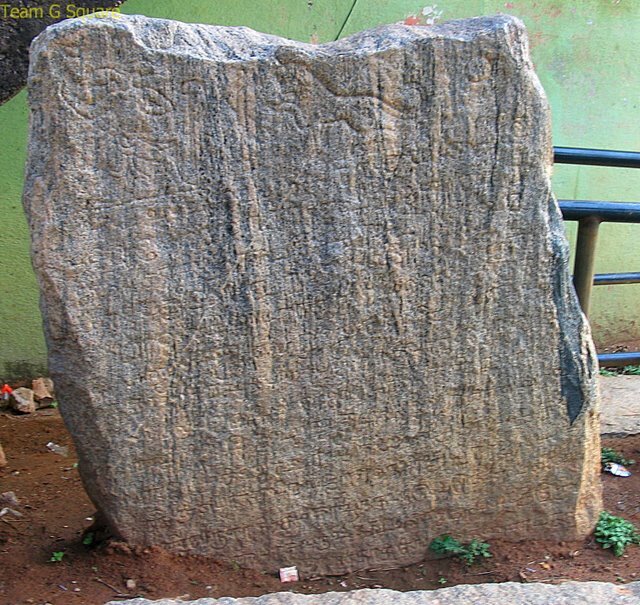 Most important amongst them are the Varadaraja Temple, Anjaneya temple, Chandramouleshwara temple and the Chowdeshwari temple. 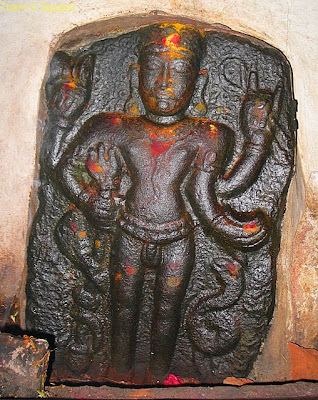 The Varadaraja temple is built in Dravidian style and dedicated to Lord Vishnu. Though the temple is completely renovated, the idol of Lord Vishnu, the four pillars of the Mukha Mantapa and the Garudagamba have survived all odds and maintained originality of the Chola architecture. There is a Tamil inscription nearby the temple. 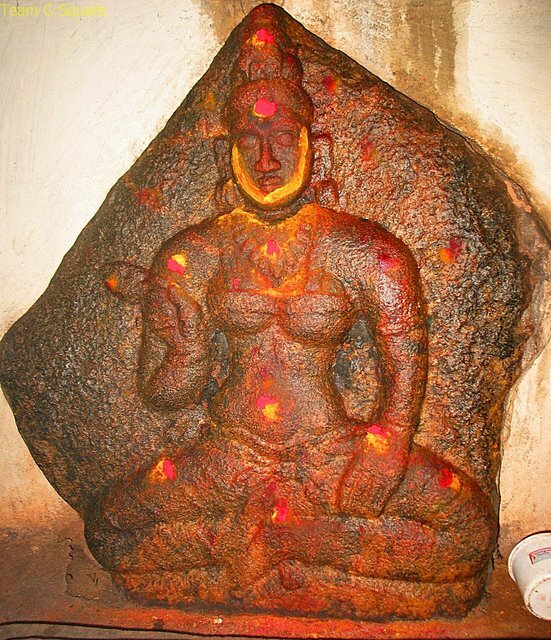 The Anjaneya temple was built by the Vijayanagar Kings. The sculpture of Lord Anjaneya is huge and beautiful. The Chandramouleshwara temple is situated besides a lake and is completely renovated, with no signs of ancient origin. 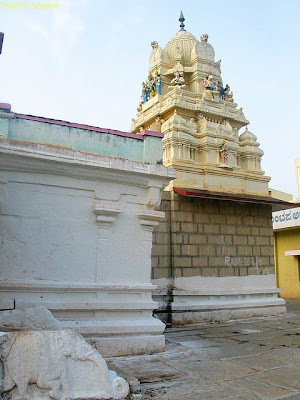 Hereon, we visited the Chowdeshwari temple located on the other side of the lake. 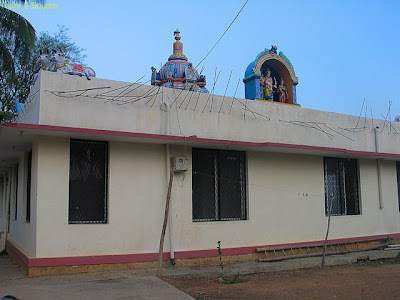 This temple is one amongst the very few temples dedicated to the Sapthamatrikas and may have been built during the same time as the Kolaramma temple in Kolar (which is also dedicated to the Sapthamatrikas). 'Sapthamatrikas' is a set of seven mothers, representing the motherly aspects of the great goddesses (Devi's) and constitute the female counterparts of the gods Brahma (Brahmani), Maheshvara (Mahesvari), Kaumara (Kaumari), Vishnu (Vaisnavi) , Varaha (Varahi), Indra (Indrani) and Yama (Chamundi). Apart from these, there are scultpures of Bethala, Veerabhadra, Shiva, Chowdeshwari and the Royal priest of Cholas, inside the temple, which are quite interesting. According to the legend, people feared to visit this temple as it was engulfed by dense forests. It was then, that a widow named Chikkamma, decided to take up the renovation work of this temple. She approached the king of Mysore and requested him to help the villagers. When the king turned down her request, she returned to her village and found her own way for saving the temple. She sold her Mangalasutra (the sacred thread, made of Gold and other precious stones, tied by the husband to his wife sanctifying marriage) and gathered money. 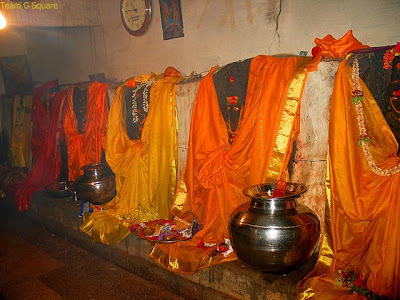 Meanwhile, the king who had refused to help her faced various problems, and on consultation and advice of the Royal Priest, decides to visit Chowdeshwari temple and perform rituals in order to get rid of all his problems. 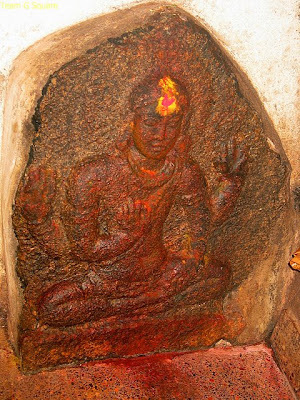 There is a beautiful Thoranagamba just opposite to the temple entrance which lies half buried and pillar that sinks a few inches every year. 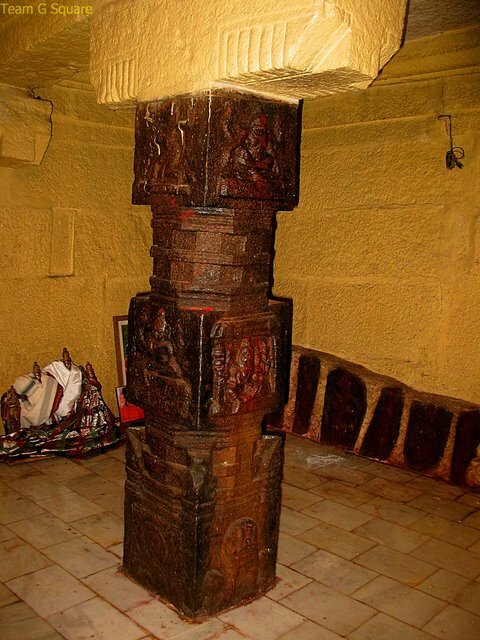 As per the priest's description, the pillar is sinking ever since Chikkamma renovated the temple and from the time he remembers, it has sunk by almost a foot. While the priest, common to Varadaraja and the Anjaneya temple lives inside the premises of the Anjaneya temple, the priest, common to the the temples of Chandramouleshwara and Chowdeshwari resides near the Chandramouleshwara temple. Both the priests are quiet friendly and helpful. Annual Jatra is held during the month of April. Wonderful post .Loved the story of Chkikkamma's restoration efforts .The sinking pillars are fascinating . Thanks for a very fascinating post -- I found it to be very interesting. I'm glad you were finally able to locate and visit this village. Your photos are very good. I like your photo of the priest(?) riding away on his bicycle in the moonlight. Very interesting post and great shots. How very interesting. Great post! Lovely new header too. What a very interesting post and I enjoyed reading about your part of the world and seeing photographs, thanks for sharing. so so interesting..thank you for all you have taught me tonight! Good to know you are putting in effort to explore uncharted territory. And then putting it here for us lazy ones to follow. The pictures are superb!! This sure is a interesting plce. lovely images of virtually unknown temples. Wonderful post as always Dhiraj. The pics are great and the history of the Temple is interesting. 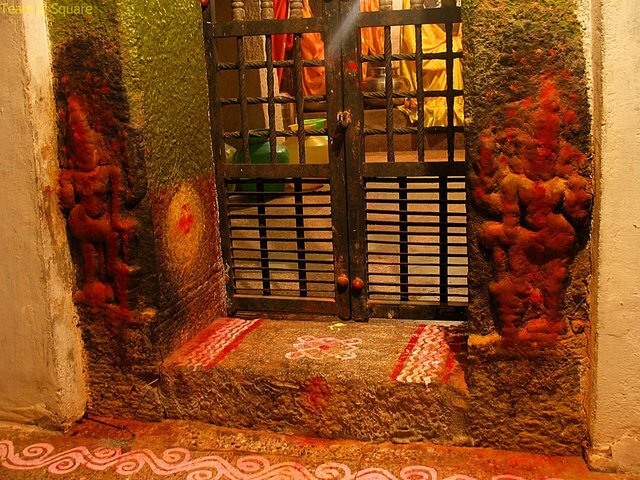 Its exhilarating to hear that the Temple is situated in dense jungle!! PS - The names in that post are changed. My name is Dipesh. But Dhiraj was inspired by you!! I have lived near KR Puram ever since and have seen the board of red bus (KSRTC)Vagata to KR Market, bet never knew that this place had such history to it. Nice to know and I will sure visit it once. It's the birth place of my late.dad., I visit Vagata oit'sn a month.... The powerful silver crown of Varadaraja has been donated by my great grandpa. It'll be displayed to public only during the annual Ratotsava ceremony (5th day after Chandramana Ugadi). You can see all the three silver crowns, which are traditionally designed by an expert with magical powers. I always prefer standing one among the hundreds and proudly see the crowns presented by my great grandpa to Varadaraja & his devis. This village is known for intellectuals, but nowadays it's image is getting spoiled because of politics & uneducated cheap youth, getting involved in dirty things. None of them are aware of the facts you have mentioned in your blog. Good work.... Keep going. Type VAGATA VILLAGE IN YOUR FACEBOOK ACCOUNT. This village also knows as "Rathapuri" during puranas time, this particular place belongs to Lord Varuna [Indra] guru of Agni. 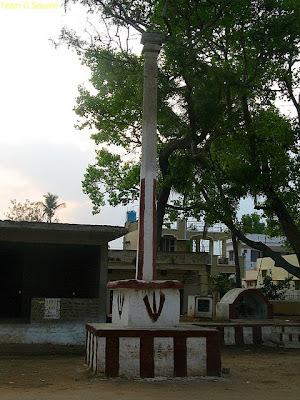 Agni did tapassu in this place for one sin and he installed Sri Venkateshwara with Sridevi and Bhudevi in Chikkatirupathi, the whole area till Chikka Tirupathi was called as "Khandava Vana", the Ratha used by Sri Krishna and Sri Arjuna is exist in and around VAGATA village, therefore it was known as "Rathapuri". Many idols are still exist in this region, will come out after few years.